Warkworth is a town in the upper North Island of New Zealand. It is located in the Rodney District and lies at the far north of the Auckland Region, just south of the Northland Region. It is located on State Highway 1, 64 km north of Auckland and 98 km south of Whangarei, and lies at the head of Mahurangi Harbour. According to the 2006 census, the permanent resident population was 3,270, an increase of 15.7% in the preceding 5 years.. This figure swells during the summer, as many holiday makers come into the area over the Christmas period. The Warkworth district is known as the Kowhai Coast, named after the native kowhai tree. Warkworth is well known for its ducks, which live around the river running through the town. The town's annual Kowhai Festival is one of the largest community festivals in the country, running for around a week in spring. The final day of the festival used to be a whole-day event of family fun, rides, street stalls, music, food and wine, with the main street closed to accommodate the tens of thousands of visitors who attended, and ending with a parade. The organisers now lack funding for this day to continue with its old flair. Geography One of the most prominent features of Warkworth is the Mahurangi River, an estuary which runs right through the township, where it then joins the Mahurangi Harbour and flows into the Hauraki Gulf. 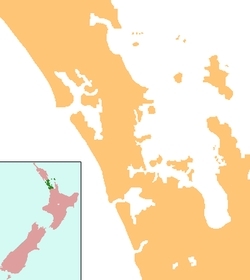 On the eastern side of the river is the Mahurangi East peninsula, with the seaside towns of Snells Beach and Algies Bay. It is here that the scenic Kawau Island is found, notable for its historic Mansion House, once the private retreat of Governor Grey. East of Warkworth and north of Mahurangi East lies the Tawharanui Peninsula, home of the Tawharanui Regional Park and Tawharanui Marine Park. To the north is the town of Wellsford, with the thickly forested Dome Valley lying in between. On the west coast lies the Kaipara Harbour, while to the south is the small historic township of Puhoi and further south the larger town of Orewa. Warkworth was founded in 1853 by John Anderson Brown (born Newcastle upon Tyne), who named it after the village of Warkworth, Northumberland, where one of his relatives had taught for many years. Early industry included logging of kauri and other timbers, flour milling and boat-building. The first portland cement manufacturing works in the southern hemisphere was established near the town in 1884. The ruins still remain and the mine is now a popular local swimming hole. New Zealand's main satellite communications ground station is located 5km south of Warkworth. Mahurangi College is a secondary (years 7-15) school with a roll of 1095. Warkworth Primary School is a contributing primary (years 1-6) school with a roll of 611. Both schools are coeducational and have a decile rating of 8. Warkworth, Ontario (This town in Canada was sistered in 2003). This page was retrieved and condensed from (http://en.wikipedia.org/wiki/Warkworth) see Wikipedia, the free encyclopedia, January 2009.